Our guest contributor this week is Pat Barch, the Hoffman Estates Historian. This column originally appeared in the February 2016 issue of the Hoffman Estates Citizen, the village’s newsletter. The column appears here, courtesy of the Village of Hoffman Estates. The intersection of Higgins and Golf Roads was a busy intersection in the 1930s and 40s as it is today. 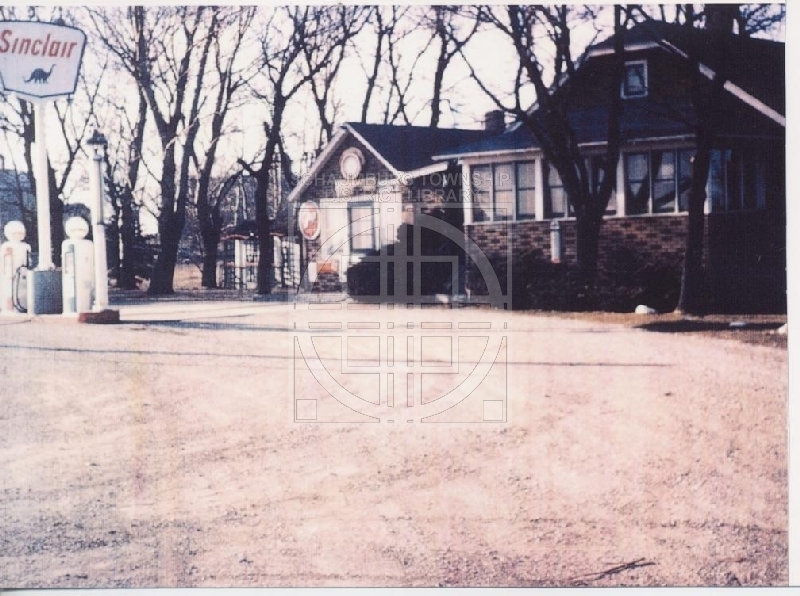 During the farming days of Schaumburg Township the service station was a necessary part of the community. The Sunderlage family had a gas station and small grocery store on the south side of Higgins across from what was their granddaughter and her husband’s farm, the Christenson farm. It was a meeting place for the farmers who went there with their milk for pick up by the local dairy. Another gas station was also located at this intersection serving the motorist with personal service that has long since disappeared. Excellent mechanical work for their cars, a fill up and windows washed was expected when you pulled in but most enjoyed a friendly welcome by the owner, Anton Kosnik. Anton Kosnik and his family established their home and gas station at Higgins and Golf in 1928. A picture and caption of Anton being presented with a 25th anniversary plaque by Standard Oil was in the Daily Herald on 7/14/60. The story of this gas station came to my attention this past year with a call from a gentleman who remembered the gas station and the son of Anton Kosnik. He and many of his young friends, who were now gray haired, had wondered about Anton’s son and whether or not he was still alive. Yes, Anton’s son was still alive. With help from old newspaper stories and a photo, the gentleman’s question could be answered and further information shared with him. It was another reminder of how the neighborhood gas station was more that a service station. It would become the hang out for customers and their kids. What had happened to the friendly young man? Anton’s son had cerebral palsy and the other kids would always be around if he needed help. The gentleman who called me asking for help, made me realize how the history that we write about and the resources that we rely on are important to those who remember special people, events or memories from the past. Many thanks to Schaumburg Township District Library’s historian Jane Rozek who is invaluable in helping with research. In researching the last two blog postings on the Kosnik and Sunderlage gas stations, it was impossible not to notice the other stations that were in the area. Like the homes that seemingly sprang up out of the ground, gas stations did the same. It makes sense, though, when you consider that all of these homes were developed in an area that was fairly remote and distant–in a suburban sense–from other town centers. Thus the need for a gas station nearby. While perusing a 1959 phone book that we own, I looked under the category “Automobile Service Stations” in the yellow pages. Amazingly enough there were six located in Schaumburg Township. As you can imagine, most were clustered in the Higgins/Golf/Roselle Road triangle. Bud & Bob’s Pure Service Station, according to reader Jon Guiney, was on the northwest corner at Higgins and Roselle in Hoffman Estates. Their ad said they were open every day of the week and offered the following services: road service, towing, mechanical repairs, free pick up and delivery, brake service and generator and starter service. Kosnik’s Service Station on Higgins Road at Golf. You can read their story here. Luck’s Cities Service at Golf and Roselle Road on the SE side of the intersection in the Hoffman Estates Plaza. Myron Luck and his brother built the station around 1957 according to Myron’s daughter Cynthia. They offered road service, tune ups, ignition, clutch and brake repair. R & W Sinclair Service at Roselle and Golf Roads in Hoffman Estates. They offered free pickup and delivery, road service, washing, minor repairs, tune ups and brake service. According to their ad, R & W stood for Ron and Wayne. Edward Sunderlage [station] at Higgins and Golf Roads. They were an authorized Sinclair dealer and were opened every day of the year. They did lube jobs and sold accessories and honored credit cards. You can read their story here. Tony’s Sinclair Service at Higgins and Golf Roads. that was a full service station. 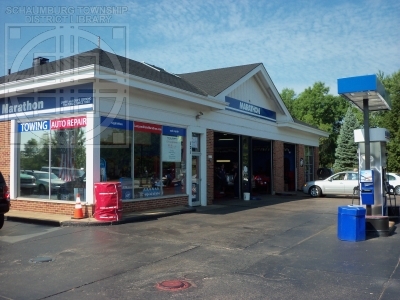 They offered road service and towing, motor tune up, major auto repairs, lube jobs, accessories, batteries, pick up and delivery, and automatic transmission service. They also had 3 service trucks that did the towing and pick up and delivery. I find it remarkable that there were three stations at the intersection of Higgins and Golf: Kosnik’s, Sunderlage and Tony’s. Each station clearly had their own specialties and a loyal clientele. Which brings us to another point… Tony’s and Sunderlage’s were directly across the street from one another and they were both Sinclair stations! Plus, there was another one at Roselle and Golf. Clearly, this was a popular brand of the time. Being unfamiliar with Cities Service, I quickly discovered that this was the precursor to Citgo. Do you remember other Cities Service stations in the area? Does anyone recall which corner Bud & Bob’s, Luck’s and R&W’s were on? Feel free to add any other early gas stations of Schaumburg Township. There were some in the Golf/Roselle/Higgins triangle that came later. I’m also fairly certain there were others around Meacham Road. Your clues will help! Last week it was stated: It was the best of times for two small gas stations that sat at the crossroads of Higgins and Golf Road in Schaumburg Township. And the worst of times never happened because both owners did not leave until they retired. Their stations survived at the junction of these two major roads in Schaumburg Township for over 30 years. They were Kosnik’s Service Station and the Sunderlage Service Station. And because of their close proximity, the two station owners were obviously competitors but they were also good friends. The Sunderlage Service Station was begun in 1932, four years after the Kosnik Service Station. It was located on the north side of the intersection of Evanston-Elgin and Higgins Roads. The owners were Edward and Amanda (Gieseke) Sunderlage who married in 1903. Seven years later, in 1910, the Sunderlages purchased what is today the Vogelei property from Amanda’s father, Friedrick Gieseke Jr. They took up residence in the small frame home that was on the property and, in 1916, they built the large two-story house that still resides at this location. Searching for a way to gain some income during the Depression, Edward decided to start a service station on a corner of his property in 1932. He and his sons, Edmund, Erwin and Marvin moved an old kitchen to the site. It had been part of the original house that Edward and Amanda lived in and were now using as a tool shed. They then proceeded to construct a house adjacent to the gas station. It was built mostly from the lumber of an old barbershop in Palatine and had no indoor plumbing. Edward’s son and daughter-in-law, Erwin and Ella Sunderlage, along with their children, then moved into the house. Ella managed the service station while Erwin worked as part of a PWA construction crew building local highways. Their third child was born in the house. Ella added to her income by making and selling slices of pie and coffee to the Depression PWA workers working on the highway. The pie operation was so profitable that it was moved to the basement of her in-law’s home. Edward and Amanda Sunderlage operated the gas station for the next 27 years, eventually becoming Sinclair dealers. According to the 1959 telephone directory, the station offered Sinclair products, lubrications and accessories. They honored credit cards and were open daily, including Sundays and holidays, until 10:00 p.m.
During these years indoor plumbing and a porch were added. A separate two-car garage was built near the back, trees were planted and large stones were placed to delineate the grass areas from the gravel driveways. It was also during this time, that the service station served as a pickup spot for milk for the local farmers. They would gather at the station while waiting for the milk truck to arrive and share the latest gossip and news. Edward and Amanda retired in 1965 and sold the service station to developers. The two-car garage was dismantled by Edmund and his sons and rebuilt on their farm near Hampshire, IL. The remaining buildings were torn down. Only the Vogelei House and Barn remain on the original Gieseke/Sunderlage property. Thus ends the Tale of the Two Gas Stations. If you have any memories of the Sunderlage Service Station, please do share them with us. We’d be happy to hear your stories! Many of the details written here and the photo of the gas station were graciously provided by the Sunderlage family. My thanks to them for sharing their family’s history. It was the best of times for two small gas stations that sat at the crossroads of Higgins and Evanston-Elgin (Golf) Roads in Schaumburg Township. And, fortunately, the worst of times never happened because both owners did not leave until they retired. Their stations survived at the junction of these two major roads in Schaumburg Township for over 30 years. They were Kosnik’s Service Station and the Sunderlage Service Station. Because of their close proximity, the two station owners were obviously competitors but they were also good friends. The first station to open was Kosnik’s. According to a Daily Herald article from July 14, 1960, Anton Kosnik opened his station in 1928. It was located on the west side of the point of the intersection. The building faced east towards the point and was accessible from either Higgins or Evanston-Elgin roads. It was closest to Evanston-Elgin; thus, the largest entrance was off of that road with a U-shaped entrance giving access to Higgins. By 1935 Mr. Kosnik was a Standard Oil dealer. Not only did he sell gas and provide basic automotive services but he also shared his home and business with travellers during a blizzard in December 1950. Snow began falling early on Thursday, December 14, 1950 and by 4:30 the roads began drifting shut due to high winds. The Kosniks began taking in people who had abandoned their cars on the roadside and were still doing it at 2:00 in the morning. According to a Daily Herald article from December 15, 1950, “the Kosnik’s home and station overflowed with 45 people. The Kosniks gave up their beds and distributed blankets and pillows as far as they would go. Hot soup and coffee were served all night [with] the Kosniks staying up and checking to see that everyone was comfortable. In the morning they prepared breakfast for everyone, the last of the refugees leaving for their respective homes Friday afternoon.” Such was the nature of life in rural Schaumburg Township. Neighbors helping neighbors. Maybe you remember the Kosnik Service Station and Mr. Kosnik? Or your parents might have bought gas or had their car serviced there? Maybe you have a good recollection of when his station closed? If so, please feel free to leave a comment. Next week, it’s the tale of the other gas station! 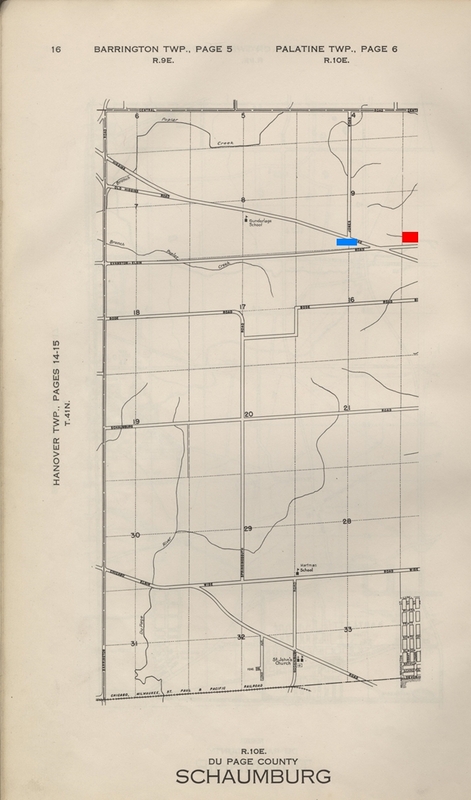 Use of the map was graciously granted by the Cook County Highway Department. Recollections of the Kosnik Service Station, house and family were graciously shared by the Sunderlage family and Larry Nerge. In the late 1950s a Standard Oil service station was built at 121 W. Schaumburg Road, just west of the intersection with Roselle Road. The property was owned by a Florida businessman and Standard built the building, leasing it to an unknown entrepreneur for about six months. When the lease came open, Larry Dworzynski of Waukegan, a salesman for Texaco who had always wanted his own business, took a jump and signed the lease. It was 1960 and he called the station Larry’s Standard Service. Not quite sure how things would go, he gave it a year and worked both jobs. He hired a station manager who ran the business while he was selling for Texaco. The station was full service with an attendant pumping gas, checking the oil and cleaning the windshield. He provided a towing service and had two bays with mechanics to service the cars should other problems arise. Two more bays were added by Standard sometime in the 1970s. Business was good and the people of the Schaumburg area grew to appreciate and trust the service and repairs that Larry provided. During the 1970s and 80s, Standard Oil began changing their stations to the Amoco name which was short for American Oil Co. Larry’s Standard became Larry’s Amoco sometime around 1987 although an ad from September 1989, still refers to the station as Larry’s Standard. Around this time, Larry became sick and, at the young age of 31, his son, Dan took over the business. Pleased that his son was joining the business and before he passed away, Larry changed the name of the station to Larry and Dan’s Amoco. When Larry died in September, 1990, Dan then became the sole proprietor of the lease. This arrangement lasted until 1997 when Amoco decided that they would prefer the station operate as a mini-mart. Rather than accept that plan, Dan bought the business from Amoco and the land from the owner and became a Marathon franchise in May 1998. The name was updated to reflect the change and became Larry and Dan’s Marathon which it is still called to this day. The business has been a vital part of the village of Schaumburg for over 50 years and, in particular, the Olde Schaumburg Centre. 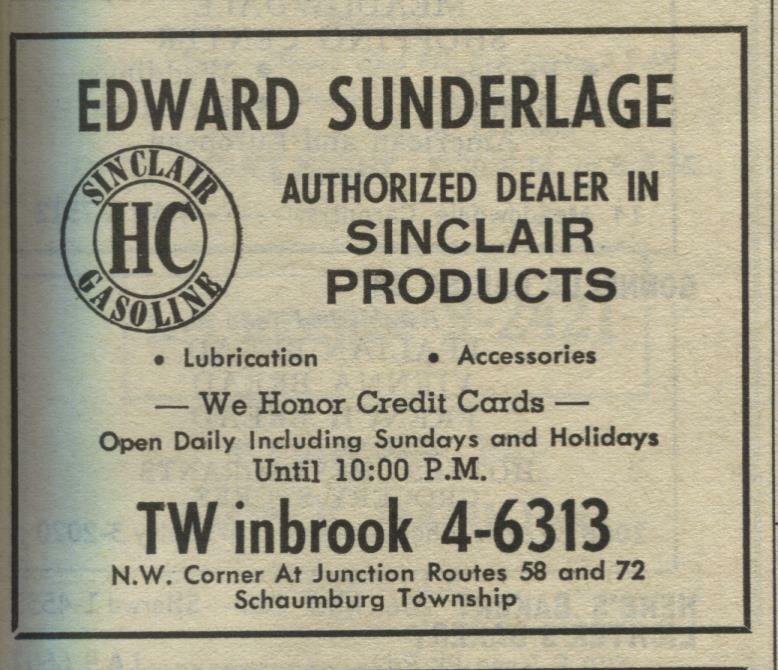 They have supported the community from the beginning as can be seen in an ad they placed in the April 7, 1966 issue of the Schaumburg Herald congratulating them on their coverage of the area. They have been a sponsor for various sports in the Schaumburg Athletic Association, have been a site for blood drives for LifeSource, gave 20 turkeys to the Schaumburg Township Food Pantry and gave customers a break on their oil changes if they, too, brought in foods to contribute. They have even sponsored the Harper College Steel Band at the library’s summer concert series in Town Square. And, in October of 2002, they were noted as the Business of the Month by the Mayor Larson and the village of Schaumburg. 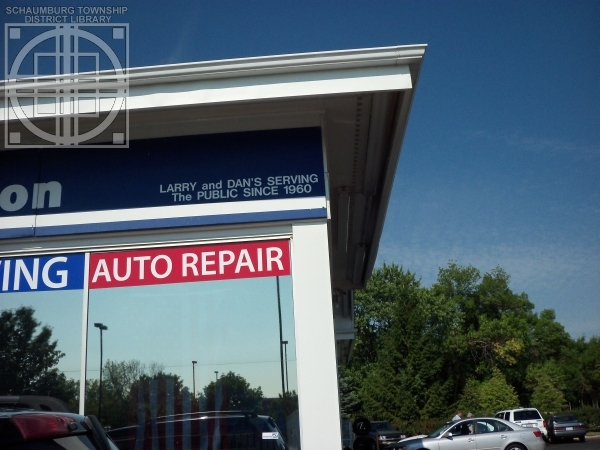 Other gas stations and their owners have come and gone in Schaumburg Township but Larry and Dan’s has been an historic mainstay of the community from almost the very beginning. And they still kindly provide pump service to drivers with disabilities! This posting was written with the assistance of owner, Dan Dworzynski, www.larryanddansmarathon.com, articles, columns and ads from the Daily Herald and the Winter 2002 issue of the Village of Schaumburg’s Cracker Barrel.